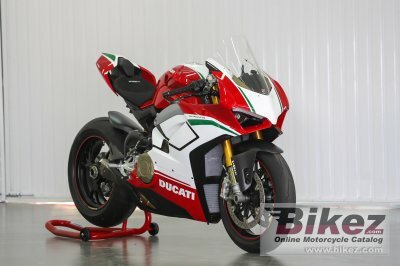 2019 Ducati Panigale V4 Speciale. Picture credits - Ducati. Submit more pictures. The new V4 90� engine, based on the experience gained in MotoGP where the performance of the four-cylinder Desmosedici is at the top of its class, was designed to equip future Ducati supersport models. By transferring the technology of its most powerful engine from competition to production, Ducati offers its enthusiastic customers the experience that has been acquired over many seasons of MotoGP. Fuel system: Injection. Electronic fuel injection system. Twin injectors per cylinder. Full ride-by-wire elliptical throttle bodies. Exhaust system: 4-2-1-2 system with 2 catalytic converter and 2 lambda probes. Rear suspension: Fully adjustable Ohlins TTX36 unit. Aluminium single-sided swingarm. Comments: Traction control. Limited edition. Ask questions Join the 19 Ducati Panigale V4 Speciale discussion group or the general Ducati discussion group. Enter your e-mail to join the 2019 Ducati Panigale V4 Speciale forum and get notification of answers and new messages about this bike. You can unsubscribe with a single click. Bikez does not display, sell	or misuse e-mail addresses. Bikez has discussion forums for every bike. View comments, questions and answers at the 2019 Ducati Panigale V4 Speciale discussion group. You can sign up for e-mail notifications when other riders answer you. If you have extensive experience with the MC, please send us a review. If you consider buying this bike, you should view the list of related motorbikes Look at photos. Compare technical specs. And check out the rating of the bike's engine performance, reliability, repair costs, etc. You can compare the rating with other bikes.